This apartment is located at the foot of the ramparts of the Medieval City of Carcassonne It is a traditional stone-built house with a terrace and garden above a garage. From this house you can climb a footpath in 2 minutes to the City. In the other direction, you can visit the Bastide Saint Louis with its shops and markets. The airport "Salvaza" of Carcassonne is less than 10 minutes by taxi or by the bus which can drop you at Trivalle, at 300m walk from the house. Please note that Rampart Cottage is situated only a few yards from Rampart Studio, an apartment somewhat smaller --and cheaper-- than the cottage. You can see the Studio also advertised on Home Away. If both properties are hired together it is possible to sleep 9 people. The ground floor of the cottage has an open-plan kitchen with an electric oven, a ceramic hob (4 burners), a microwave, a refrigerator with a freezer and a dishwasher. There is a room for a fireplace and a stove in the kitchen. There is a TV set with box and internet access, a DVD player and a CD player. 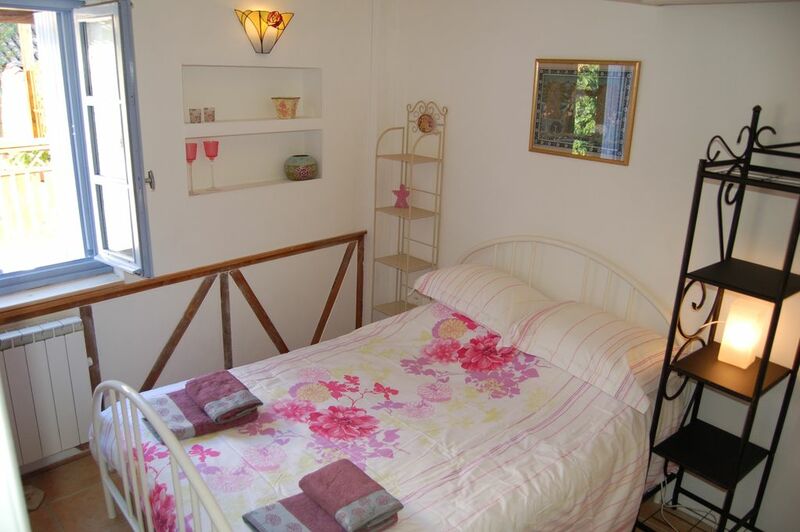 On the first floor A bedroom with double-bed opens onto a smaller bedroom which is mainly used as a TV room but has a sofa-bed where you can sleep.
. On the second floor, is a bedroom with two single beds. This is a renovated loft space with some restricted headroom. Outside - 3m from the front door of the house which is used for storage and washing machine. This is a large terrace with a small garden, equipped with tables, chairs, sun beds and a barbecue. This provides a very pleasant sitting-area with views to the rooftops to the ramparts of the city - a place in which to relax in sunshine or in shade. Access to the terrace by a steep staircase, could be difficult for someone with reduced mobility. The street is pedestrianized - which makes for peace and quiet, and safety. Cars can be parked in the city, with some off-road parking. But please note you can have a good time here! Note there is an grocery store (groceries, bread, croissants) within 300 yards, open mornings and evenings. General --- your rent covers, cleaning, all bedding & towels, all services. Entry times are usually flexible, from early mornings to late evenings. Most reservations are for periods of one or two weeks but we accept less periods of three days minimum.